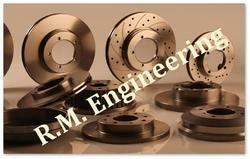 Offering you a complete choice of products which include slotted brake disc and brake rotors. We are listed at the apex to manufacture and supply Slotted Brake Disc that is compatible with Scorpio, Tata ace, Tavera, Tata Indica, and Mahindra utility. Precision engineered, it is highly acclaimed among the customers, we have. Manufactured using high-grade metals and alloys, the entire range of slotted brake disc offered by is resistant to wear and tear. This brake disc is also highly durable in its features.